I offer private lessons of German, or class for couples (Paarkurs) as you have read in my introduction page Private German Lessons. In the current page you find all the info you need to know about my courses. The lessons cover all the levels starting from A1 and up to C2. For the classification you can refer to this link. 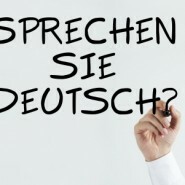 In general, A1 and A2 courses give the grammar basics of German. B1 and C2 courses are aimed to develop the vocabulary of the students and are very much focused on the conversation in German. I also offer course for preparation of the testDAF, the test that is required to access many German university, with a preparation focused on succeeding the exam. For your information DAF stands for Deutsch Als Fremdsprache (German for foreigners) and is kind of the equivalent of the TOEFL. 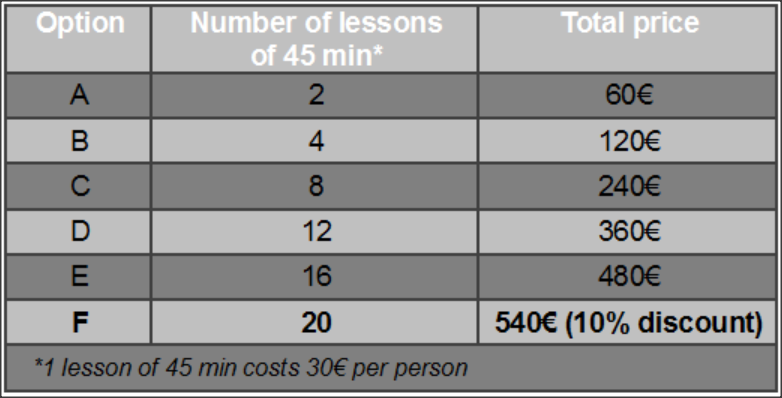 – Each private German lesson unit lasts for 45 minutes and costs 40€. Lessons in form of private course can be booked in group of 2,4,8,12,16 or 20 hours. The prices are shown in the table below. – For the couple course (private German lessons for 2 person) a unit of lesson costs 30€ per person. Lessons in form of a couple course can be booked in group of 2,4,8,12,16 or 20 hours. In the table below, you find the price for a complete course, please note that the price are per person. As you see in the tables above with a booking of an German course with option F there is a price reduction of 10%. If you are considering the possibility to book a private German lesson with me, you can decide after a free lesson of 45 min. After the free lesson you can decide if you want to continue with the course or you want to stop. In each case the trial lesson is free of charge. It’s free, use the chance, contact me!